Waluigi has stolen the four music keys from Truffle Tower and it’s your job as Mario or Luigi to reclaim these keys before the power of music wreaks havoc across the land causing natural disasters. Your dancing skills will come in handy as you clear many obstacles in your way. When in doubt, dance; that’s the motto of this game. The main portion of this game is the story mode. There are five worlds total and a few songs/mini games in each world. It is through this mode that you can unlock songs to play in Free Mode. You unlock them by playing them in Story mode or by purchasing them in a shop (again in story mode). To get to harder Story mode difficulty levels you have to play through the story in the previous difficulty. The game starts off with Easy and Normal mode. There is also Hard, Very Hard and Super Hard you can play as well. Super Hard is only available in Free Mode, which is unlocked per song as you pass them on Very Hard. You can play the mini games previously unlocked as well. The mini-games include flagpole jumping, avoiding avalanches, avoiding a chomp-chomp, and several others. Like many DDR games, you can count your calories as you play in Workout mode. The typical DDR rules apply where you have to step on the arrows when the moving arrows are aligned with them. You get rated with Perfect, Great, Good, Okay, Early/Late, and Miss. After each song you are given a letter grade from A-F. There are no double or triple A’s. DDR Mario Mix has a unique twist called Mush mode. In Mush Mode you have to stomp on Goombas, Boos, Koopas (twice), Bullet Bills as well as avoid Spinys. There are other surprises as well. If you miss a creature or an object in Mush mode your life bar will decrease dramatically. In Story Mode you can buy life rejuvenators as well as extra lives. There are less than thirty songs in this game so that’s a bit disappointing. On the other hand, there are no repeats from other DDR games. All the songs are Dance style remixes. You’ll find some classical remixes like Mozart, Twinkle Twinkle Little Star, Turkish March, and Pomp and Circumstance. Nintendo lovers will like the remakes from a wide variety of games like Super Mario Bros. 1-3, Paper Mario, Mario Kart 64 and Double Dash, Mario Party 5, Paper Mario, Wario World, Super Mario World, Dr. Mario, and Donkey Kong. I doubt you’ll find these songs in any other DDR game. Unlike other DDR titles these songs are squeaky clean. Those familiar with DDR will recognize the announcer from DDR Max. The game character voices are canned and repetitive. The worlds are very pretty and nicely detailed. Bowser’s area is appropriately gloomy with lava, etc. bubbling around you. The characters look nice and they each have their own special moves. The animation is pretty good. The game comes with a non-slip pad. It’s of decent quality, but I miss not being able to use my metal PS2 pads. We tried a controller adapter with no success. To play multiplayer, you either need to buy a second pad through Nintendo or use a controller. There is the typical cartoon/Mario style violence when it comes to bopping creatures but it’s in a playful manner and there is no blood or gore. There are also the typical Mario-style ghosts called Boos. My biggest surprise was in the tower with the four keys right in the center of them was a circle with a five pointed star in it. Of all symbols I wonder why they chose that one. It’s not portrayed as evil but it’s still there regardless. 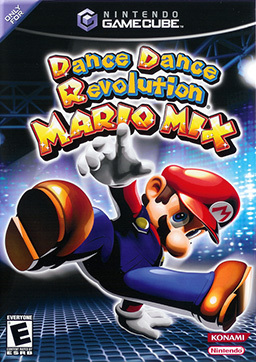 It’s about time Nintendo came out with a DDR game. The songs are good and are family friendly but there are not that many. I was disappointed about the controller compatibility as well. This is a fun game but the PS2 variants aren’t as repetitive in my opinion, though not as family friendly, either.